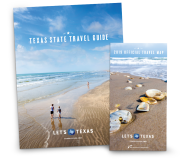 Hidden beneath the picturesque rolling landscape of the Texas Hill Country are thousands of caves and caverns. Every year, intrepid cave lovers make the pilgrimage here to walk, crawl, and swing through the state’s “show caves,” so called because they’ve been equipped with walkways and dramatic lighting to help show off their most breathtaking features. 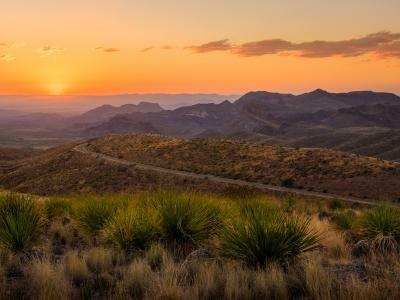 Driving through bucolic towns set amid the rolling green landscape of the Texas Hill Country, it’s difficult to imagine that just a hundred or so feet beneath your car tires are thousands of caves, some with vast chambers, waterfalls, and fossils of ancient animals. There are seven show caves in Texas, most of which are along the Balcones Fault Line between Austin and San Antonio. So when my boyfriend and I visited friends in Austin—and the guys decided to watch a golf tournament all day Saturday—we gals took the two kids and went cave crawling. Both Longhorn Cavern and Inner Space Cavern are an easy drive from Austin. I’d been to Longhorn Cavern a few years back, and I remembered it as being extraordinary. There was Crystal City, where hundreds of calcite crystals sparkled from every wall, and the Indian Council Room, where Comanche Indians communed hundreds of years ago. Since Inner Space Cavern would be a new adventure for all of us, we headed north toward Georgetown and followed the signs. In deciding which tour to take, the kids pushed for the mysterious-sounding Hidden Passages Tour, and we caved in to the pressure. We’d be heading into the deeper recesses of the caverns, so the tour guides gave everyone a flashlight. Good thing, because there was not an inch we would’ve wanted to miss. There were columns fringed with zigzag formations, flowstone, undulating waves of transparent calcite (called “drapery”), and what seemed like millions of “soda straws,” thin hollow tubes of slowly dripping calcite. After leaving Inner Space, we knew the golf game wouldn’t be over for a while, so we took the half-hour drive south to the “Outlet Mall Mecca” of Texas. That’s right, ladies. San Marcos is home to both a Premium Outlets and a Tanger Outlets, totaling 145 outlet stores. As far as my friend and I were concerned, that golf game could last forever. My spelunking spirit rekindled, I traveled with my boyfriend to San Antonio a few weeks later to visit the largest commercial cave in the state, Natural Bridge Caverns. While the Castle of the White Giants has the largest formations in the caverns, it was the Hall of the Mountain King that left us truly dumbfounded. It was 100 feet high, higher than a football field is long, with spectacular formations covering the ceiling, walls, and floor. After letting us gawk at that for a bit, the guide took us deeper into the cave and—all the lights went out! Just before I went into full panic attack, I realized this was part of the tour—a chance to experience total darkness. I wiggled my fingers in front of my eyes and —nothing. Spooky, but cool. Halfway through the two-hour drive to the next cave, we stopped for lunch at Richter’s Antler Cafe. A deer hunter’s dream, the café is named for the hundreds of racks of antlers hanging from the ceiling inside. After a great meal and a good chat with the friendly locals, we were on our way to the Cave Without a Name. When we arrived, we found out that the cave got its “no name” in 1939 from a local student who won the town’s naming contest. The student explained, “The cave is too pretty to have a name.” After seeing the cave, I can say it certainly lived up to its “pretty” billing. 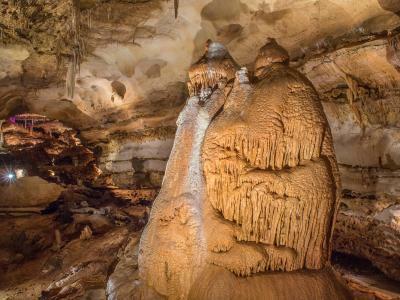 A National Natural Landmark, the cave has six rooms of extraordinary formations, including something called the Grapes. Calcite formations that do indeed look like a bunch of grapes, these inedible delights have been observed only in the Cave Without a Name. The thought of grapes made me hungry, so we grabbed some fruit from a roadside stand (it was springtime and produce stands were everywhere) and headed west. A kind of oasis along Interstate 10 on the way to West Texas, the town of Sonora is best known for its beautiful caverns. In fact, Bill Stephenson, founder of the National Speleological Society, said, “The beauty of the Caverns of Sonora cannot be exaggerated, not even by a Texan.” We were happy to discover that he was right. Once we were underground, the guide’s voice faded as I peered in every direction, trying to take it all in. One formation looked like a crystal butterfly, and we saw a five-foot-long soda straw. Other people were commenting on the helictites, cave bacon, and fishtail formations. When the tour ended, we went to the gift shop, and I was going to buy trinkets, but then I saw the homemade fudge. I’m only human. Driving home, we knew we’d go back to Caverns of Sonora for the four-hour Discovery Challenge, during which we would get to rappel into something called the Devil’s Pit. After that, I’m pretty sure we’ll need more fudge. Longhorn Cavern, just west of Austin, has a colorful history. Legend has it that in the 1800s, the outlaw Sam Bass used the cave for his hideout, and during the Civil War, the Confederate Army made and stored its gunpowder there. In the early 1900s, it was used as a dance hall and place of worship by a local church.